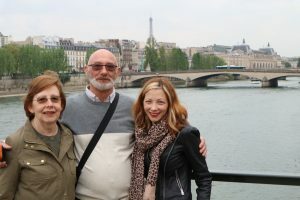 Last weekend I took a trip to Paris for four days with my family to celebrate my Mum’s 70th birthday. I decided that it would be a great challenge for me to wear only handmade clothes during the trip. Our flight left Bristol at 7:30am so we arrived in Paris at about 9:15am. 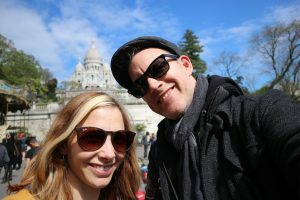 After a ridiculously long (and overly expensive) Taxi journey to our hotel, we dropped off our bags and headed out to visit Sacre Cour to get a good view of the city. 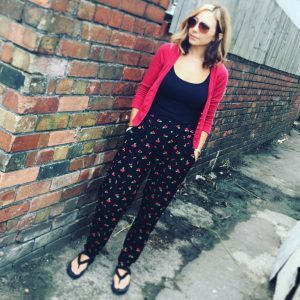 I wore my cherry print Sew Over it Carrie Trousers and a black vest from Measure Twice as they are super comfy for travelling in. I didn’t get any good pictures though, as I was hampered by bags and coats but here is a recent pic of them! 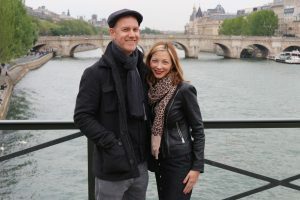 In the evening, we had a pre-dinner walk to the Louvre and a little wander along by the Seine. 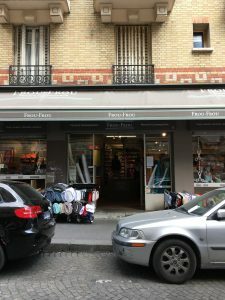 While we waited for my brother and his girlfriend to arrive, I decided to kill some time by going back to the Sacre Cour area and looking around the fabric shops. 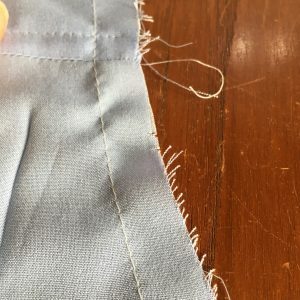 I had been given some tips as to where to look for fabric by the lovely sewsarahuk. 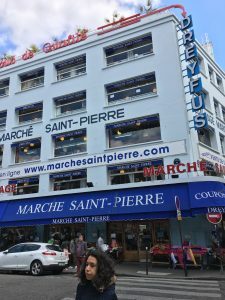 I couldn’t believe the sheer volume of shops and the size of some of them! I was actually a bit overwhelmed by choice so didn’t buy all that much! I got a lovely viscose cotton mix in an iridescent green, which will make a nice Sorbetto top . 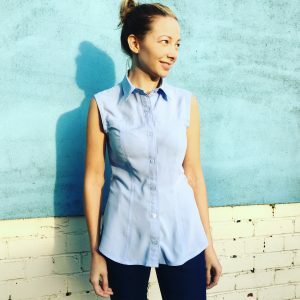 I also got a beautifully soft cotton pale blue striped cotton lawn, which I plan to make into a self-designed ruffled shirt. The last shop I visited was just huge and I only made it through the ground floor! 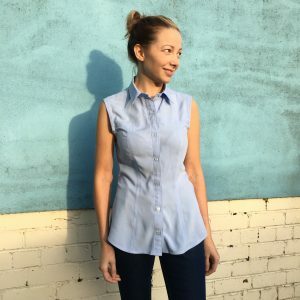 I bought some cotton to make a summer top from and also some crazy toucan and pineapple print cotton and matching pineapple print to make a circle skirt with contrast waistband – I am very excited to make this one as it will be perfect for the summer! I was nearly very tempted by the gorgeous wools and cashmere but decided to let head rule over purse! 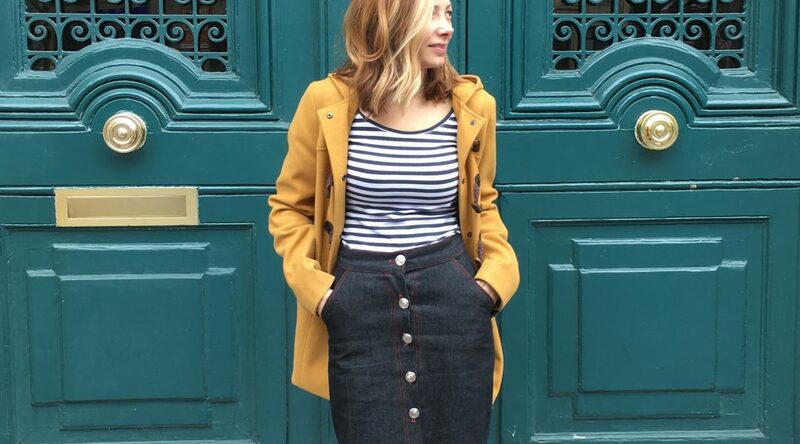 All of the details of the fabrics can be found on my Paris vlog! 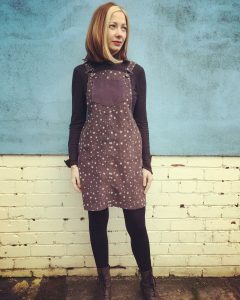 As it was such lovely sunny day, I was very excited to debut my newly made Tilly and the Buttons Rosa shirtdress. 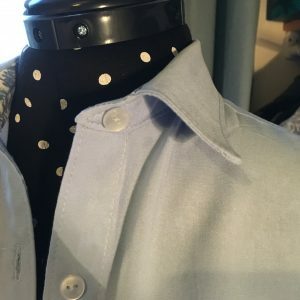 I made it from a maroon spotty Robert Kaufman chambray that I bought from Sewn. 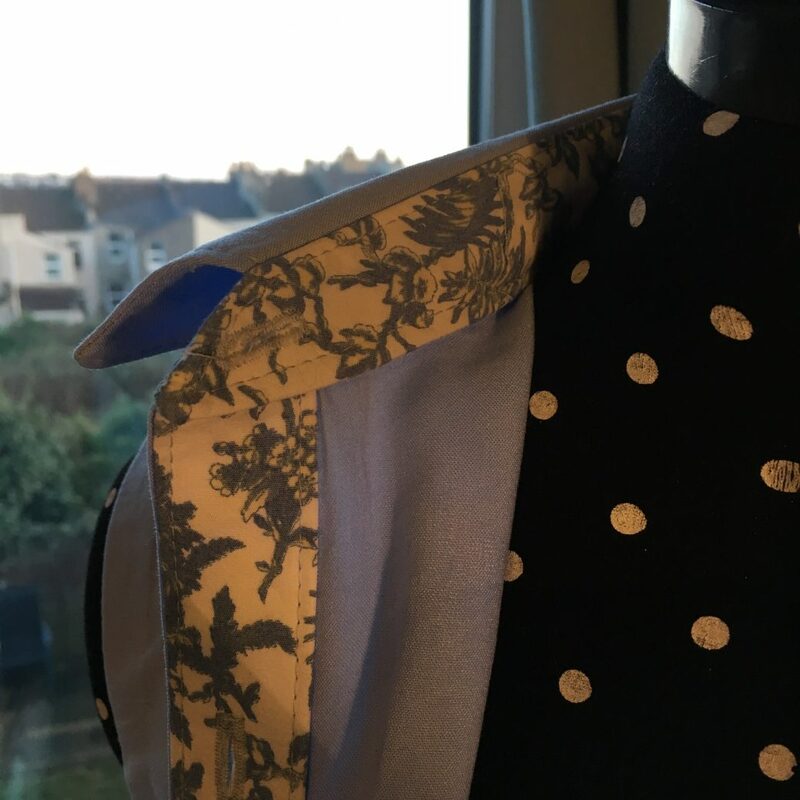 I love that the reverse of the fabric can be used too so I made contrasting yokes, inner collar band and button plackets. I am so pleased with how it turned out and love the contrast detail. I decided against adding the patch pockets and opted for more practical side pockets, which I drafted myself. As with my previous Rosa shirt, I opted to omit the sleeves altogether and finish the armholes with satin bias binding. My brother and his girlfriend arrived after lunch so we met up with them and caught up before heading out to dinner. 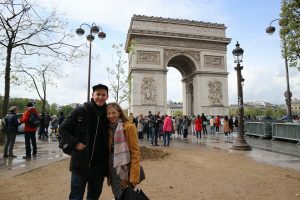 I am allergic to gluten, so eating in Paris was a bit of challenge for me. 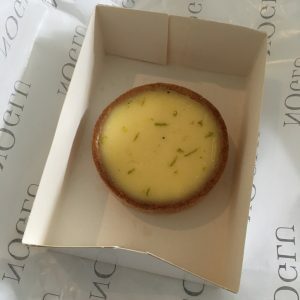 Thanks to google, I did track down some lovely places that were Celiac-friendly and on the Friday night, we went to a place called NoGlu, which was 100% gluten free. The food was incredible and I am so glad we found it. They also had a bakery where I could stock up for lunches and snacks! 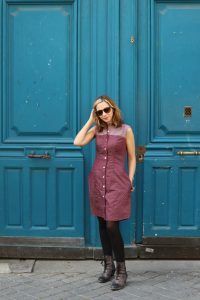 I took my Sew Over It, Mollie dress out for a boat trip on the Seine! 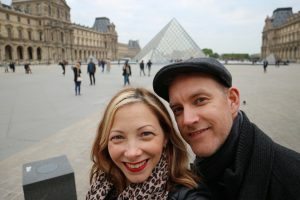 We took a hop on hop off boat and visited lots of Paris’ main attractions. 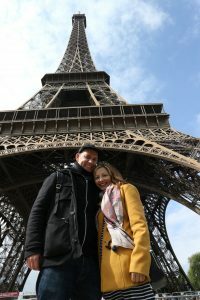 We stopped off at the Eiffel Tower and had a good look around. We decided not to go up it, as the queues were horrendous! After that, we went to look at the Arc de Triumph and then took a stroll down the Champs Elysées. 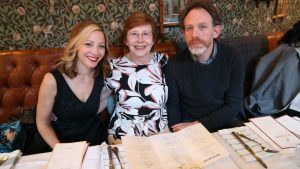 As this was my Mum’s actual birthday, we got all dressed up and went out for dinner. 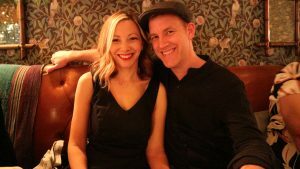 I wore my Vogue 8997 dress, which is part of the McCalls Pattern Company Cocktail Hour for the Eve Appeal. I am so pleased with the finished dress. I did have to make a few adjustments on the princess seams over the bust and also take out a good couple of inches from the back seam but it has turned out really well. 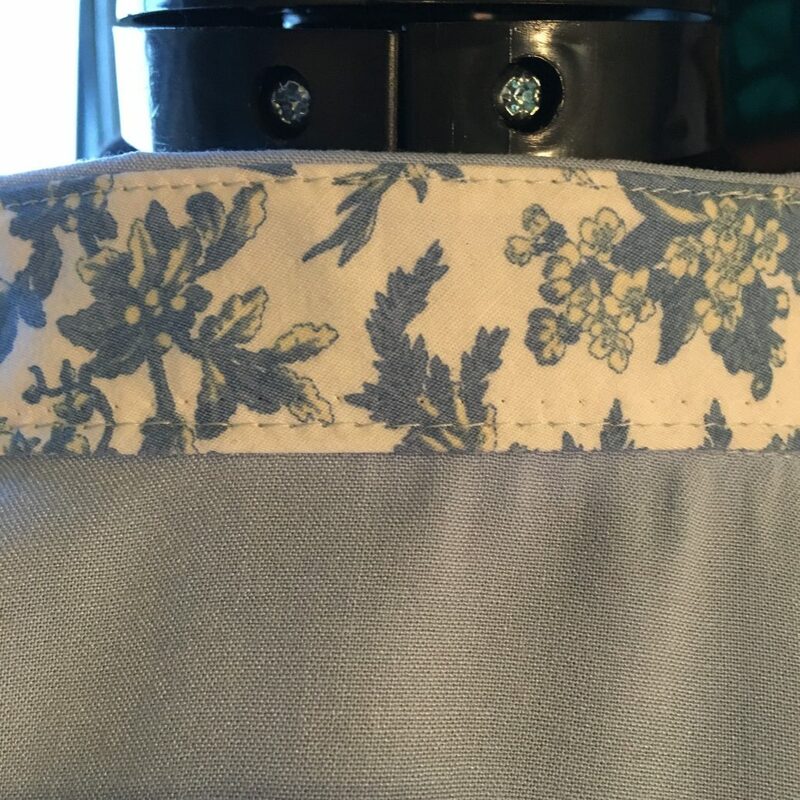 I made it in a black stretch cotton sateen and navy lining, both from Minerva Crafts. I hemmed the lining with a silver bias trim for a cute little flash of colour when I sit down! I was planning on wearing it with strappy heels but the weather wasn’t quite warm enough so I had to stick with tights and boots. 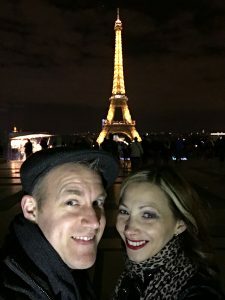 After dinner, Alex and I took a trip down to see the Eiffel Tower all lit up at night – it was beautiful and the sky had put on a stunning display of pink and purple clouds for us! 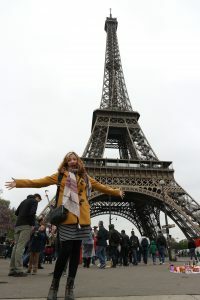 We spent our last morning wondering around the area near to our hotel and going to see the Moulin Rouge. 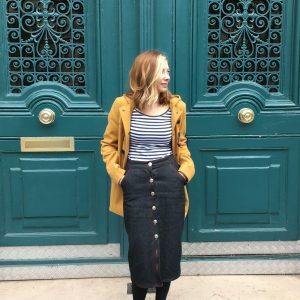 I wore my Breton Agnes top again, this time paired with my Sew Over It Erin skirt as I figured that would be a comfy outfit for travelling in. The train ride to the airport and the flight home were pretty non-eventful and we had a lovely welcome home from the cat, who pretty much hasn’t left my side since I’ve been back! You can hear more about my trip on my latest vlog. 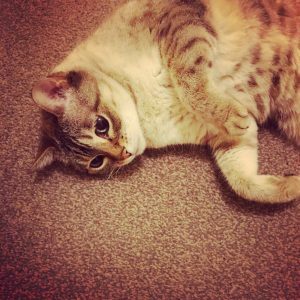 Firstly a big hello and welcome to all of my new subscribers! 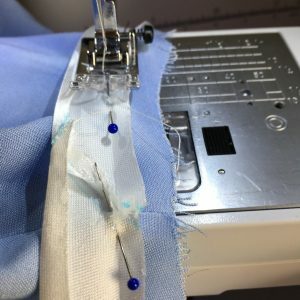 I heard a lot of talk from other sewists saying that they felt like they had lost their “sew-jo” during January – cold weather, post Christmas lull and not much inspiration being the main culprits. I have to say though, that for me, it was completely the opposite. I had so much creative energy and was super productive. 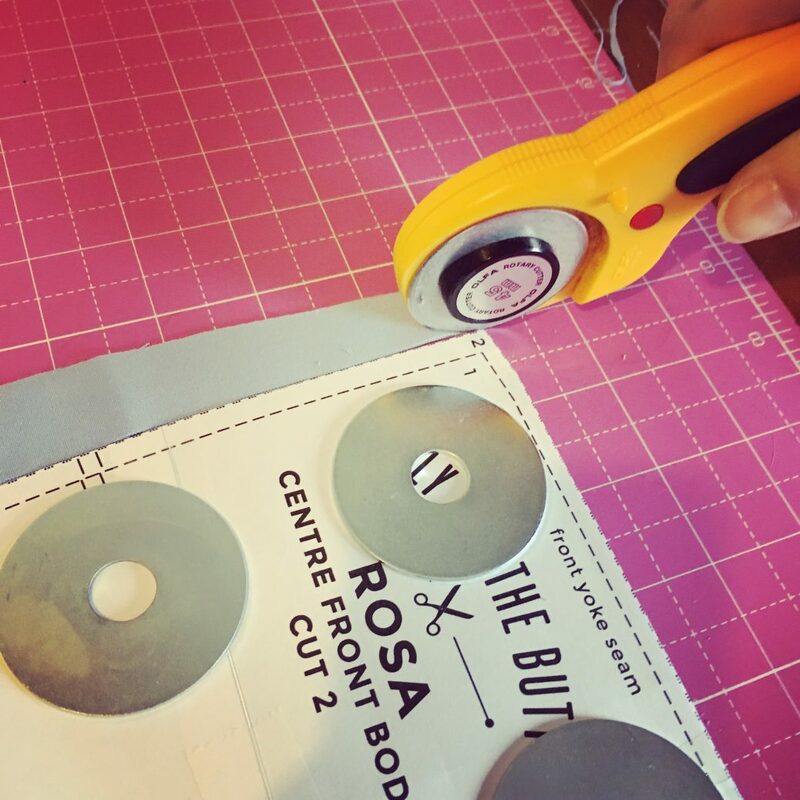 I made a grand total of 13 items for me, along with some alterations and making a skirt for a client. As I have been freelancing in my marketing day job, and my last contract finished just before Christmas, it did afford me lots of time with my sewing machine during the start of January. 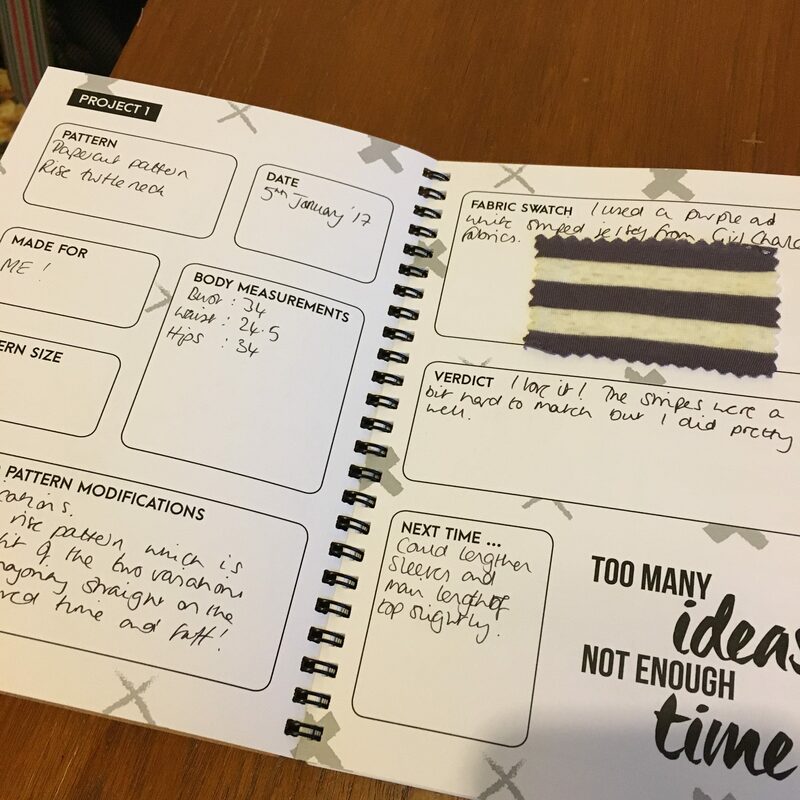 I was also bought the Maker’s Workbook by Creative Industry for Christmas, which I have loved filling out for each project – especially sticking in the fabric swatches for each project! I actually managed to rattle through five of my Make Nine projects in January alone, so I have now decided that I will try and get the original nine made by the end of March and then set another goal of nine more projects for the second quarter of the year and see how I get on. 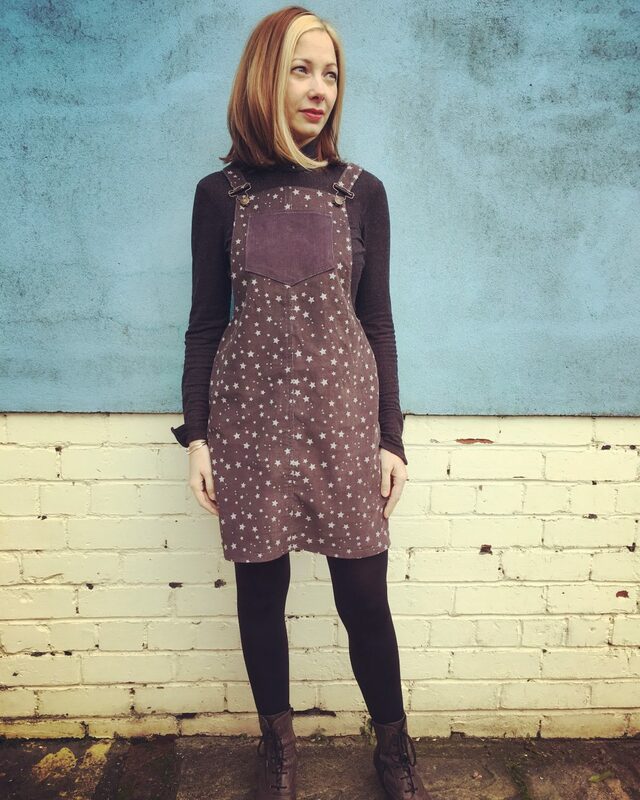 I have been looking for a good turtleneck pattern to see my through winter and wear with dungaree dresses and I spotted the Rise pattern on Instagram. It was a pretty quick make and I’m really pleased with it. 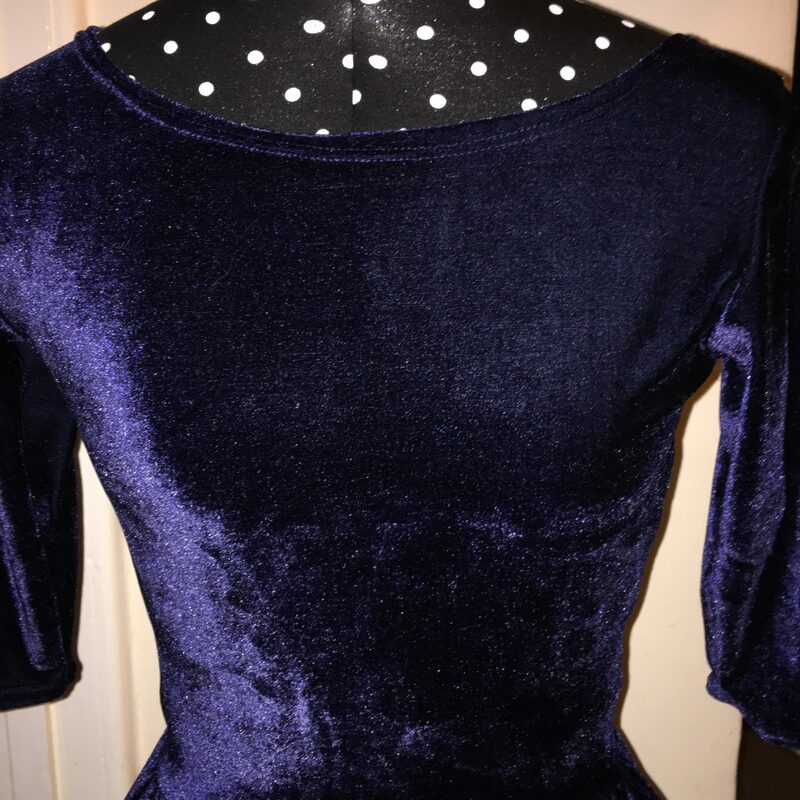 My second Cleo dress was dubbed the Cosmic Cleo due to the stars on the needlecord fabric and the sparkly topstitching thread. It’s such a great piece for winter and again, a really quick make. 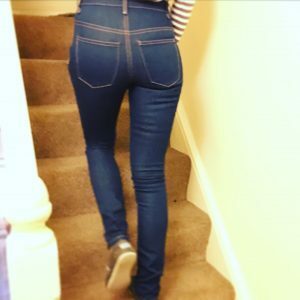 I’ve made a couple of pairs of the low waisted Ginger jeans previously and I love them. I decided to try out the high waisted option using an indigo stretch denim from Fabricland. The fit out of the packet is pretty much spot on and I only needed to reduce the seam allowance below the knee to make them more comfortable and move the back pockets to make them more flattering. 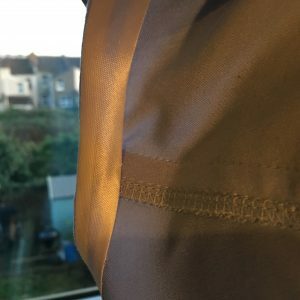 My friend and yoga teacher Keren, was holding a 70’s disco yoga session to liven up a dull and grey January, so I decided to make some suitably disco leggings for the session. They are a little ‘out there’ but I love them and have been wearing them to my yoga and dance fit classes ever since! 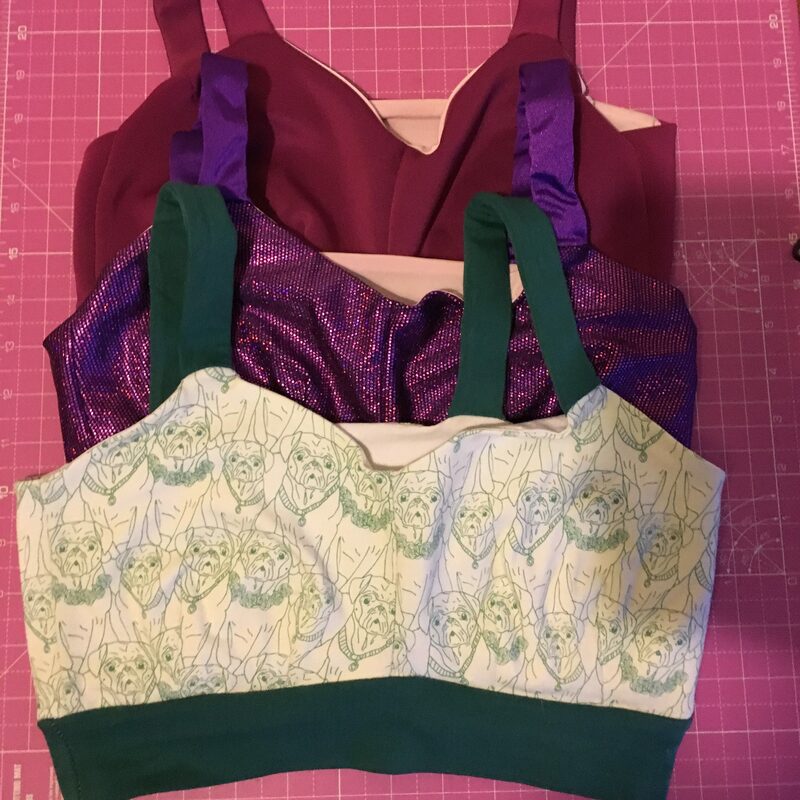 I found a free pattern by George and Ginger for the Lovesick bra and it is so comfortable that I ended up making another two and have barely worn any other bras since! I made my first one in a swimsuit fabric and then made a disco one to match my leggings, along with a pug one from some scraps left over from my Linden sweatshirt. To accompany the bras, I found the Scrundies pattern and it turns out they are the comfiest knickers in the world! 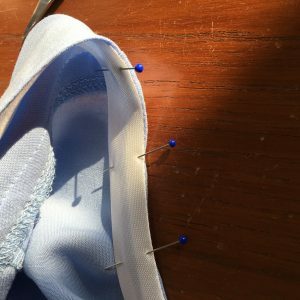 I’ve made them to match all of the Lovesick bras and made another using scraps from my navy velvet Moneta. I see many more of these in my future! 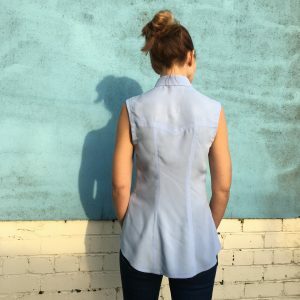 I finally got round to making the Rosa shirt. Initially I was going to make the shirtdress but thought I would get more wear out of the shirt version in Winter. It’s such a pretty colour and a wonderfully soft and drapey viscose. As the Moneta party is imminent, I busted out my pattern and made my fourth Moneta so far in a stunning midnight blue stretch velvet from Calico. Its such a wearable dress and it’s nice to have a more evening version of it. 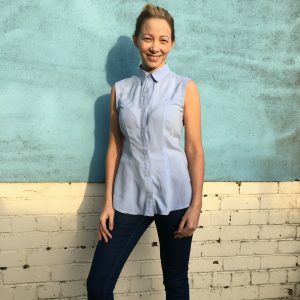 I have focused on creating items for my handmade wardrobe that are really wearable pieces.